What we know of the history of the people of Bela Krajina comes from a few sources. The oldest sources of data come from the numerous Tax Registers – accounts kept by local landowners (lords, counts, or aristocrats) of taxes collected from their landholders. The work “Urbarji za Belo krajino in Žumberk” (SAZU, Ljubljana, 1991) by Dušan Kos is a transcription of 10 of these registers from the 15th to the 18th century. The first mentions of the villages of this region are in the Register of the Dominion of Vinica on the Kolpa, 1674 and the Register of the Dominion of Krupa, 1690-1699. These registers mention many individuals with surnames that still exist in many of these villages..
Baptismal, Marriage and Death Registers of the Catholic Church, stored at the Archives of the Archdiocese in Ljubljana, offer the most comprehensive data on people from this region from the 17th century onward. The oldest registers are all hand-written in Latin. 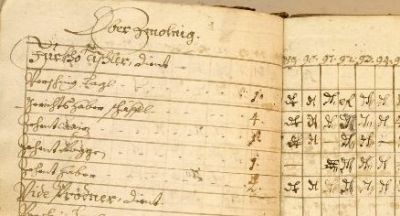 In the mid 18th century, the language changes to German, and the organization of the data takes a tabular form. Entries are also written in German, at least until 1857, when Slovenian comes into more frequent use. Status animarum records kept by local priests in Preloka since 1870, now stored at the Parish Office in Adlešiči, offer a very good summary of statistical data on the families of Zilje, as well as some very interesting anecdotal notations. Three separate volumes exist, compiled in 1870, 1881 and in 1925. The data is organized in tabular form, with headings in Latin, with older entries in German, newer entries in Slovenian. 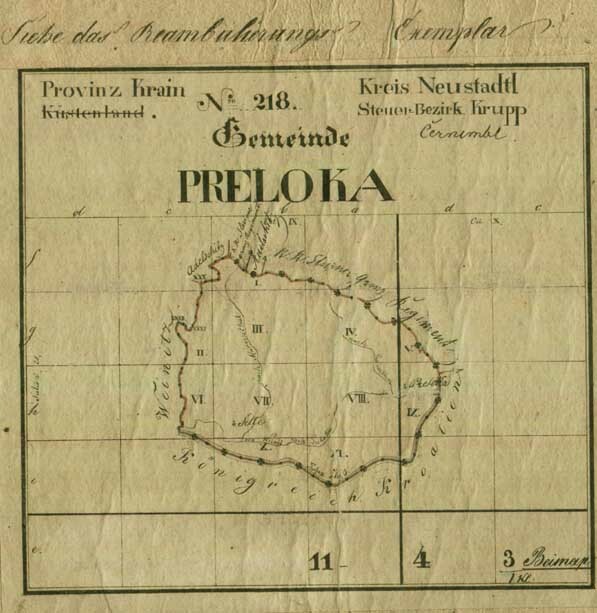 The Cadastre of 1817-1861, ordered by the Land Tax Patent (Grundsteuerpatent) of Emporer Franz I in 1817 give us a unique look at the geography of Zilje (and the entire Austro-Hungarian empire) in fantastic detail. It delineates parcel boundries, location of buildings, position of roads and use of land. 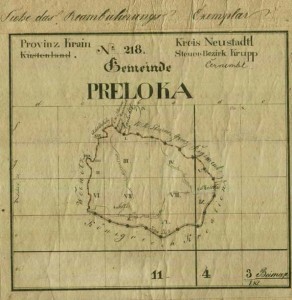 The maps of Zilje were created in 1822, with revisions added in 1868. Finally, living human sources have proven to be very knowledgeable, even knowing about people and events that occurred in Zilje well before their birth. Stories passed down from parents to children have contributed information that we could never have found in any other source. While we accept this information may sometimes be inaccurate, it has often given us a direction to where we should continue searching. Thank you to those individuals who have shared their interesting stories and knowledge!